At the Frankfurt Motor Show, Jaguar pulled the curtains off its first ever SUV, Jaguar F-Pace 2016. To be mentioned that the company has taken very well care of the performance segment. To reach the destined power, they not only worked out over the architecture and made it light in weight but also introduced entirely new powertrains. 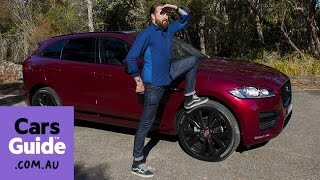 Let us have a look at the review of Jaguar F PACE 2016 to know more about its specifications and performance figures. cooling functions with 14 different adjustments. 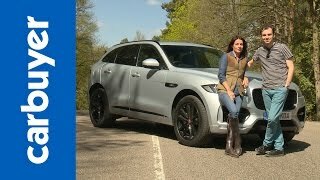 The exterior of Jaguar F PACE 2016 isn’t much of unique but undoubtedly it looks gorgeous being an amalgamation of some remarkable models. While the headlights carry the trend you noticed in Jaguar XE and ZF, the grille and the air intakes resemble to that present in some of the recently unveiled sedans. Looking through the sides, model is impeccably spectacular with its side gills that extend till the front door and the inverted crease over the body work. The design strategy gets more distinct being tough to find in the segment. Moving towards the rear end of the model, you might not notice anything ‘astonishing’ but still Jaguar managed to prepare something (from the rear corner) that can steal the gleam. 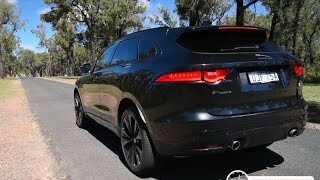 Rounding up the exterior details of Jaguar F PACE 2016 I would just say that it has some pros and some cons, not it is upon you as to what attracts you most. 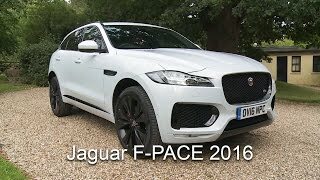 Beneath the hood of Jaguar F PACE 2016 are three powertrain options. First one in the list is a 2.0 liter four-cylinder engine generating total output of 180 hp and peak torque of 431 nm. Second and third are 3.0 liter V6 cranking total output of 340 hp and 380 hp and peak torque of 450 nm. While the 2.0 liter engine come paired to ZF 8HP45 eight-speed automatic transmission the last two mate to ZF 8HP70 eight-speed automatic transmission. 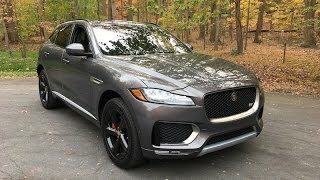 With this power rolling the wheel the performance of Jaguar F PACE 2016 touched the top speed of 129 mph, 155 mph and 155 mph respectively. While the 0-60 mph sprint can be knocked in just 8.2 seconds, 5.4 seconds and 5.1 seconds respectively.